Chris Yeh, co-author of Blitzscaling: The Lightning-fast path to Building Massively Valuable Companies, defines Blitzscaling as: The Pursuit of rapid growth by prioritizing speed over efficiency in the face of uncertainty. Google at the time was just getting started, with revenue of $19M. By comparison, AOL first quarter revenues were $9.8 Billion alone. You can see the numbers Yeh shared on how Google grew from its relationship with AOL and others as it began to gain traction on its journey to become the largest search engine on the Internet. The fuel of Blitzscaling is Capital and Talent. Because some of the growth factors for Blitzscaling include big market, and massive distribution, it may not directly affect or be relevant to your market or strategy. There are some major factors to consider, including the risk involved. Yeh shared the stages of Blitzscaling (see graph) explaining the toughest is Village stage. There are a number of risks involved to Blitzscaling, including Piracy as well as ethical issues. The challenges UBER faced with their previous CEO is an example of the ethical challenges a Blitzscaling business faces. 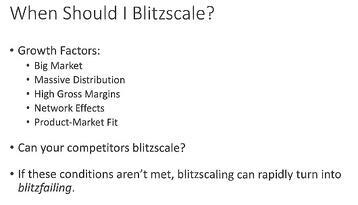 Blitzscaling involves a number of counterintuitive rules. If you’re not comfortable with them you may be unwilling to face the risks Blitzscaling involves to succeed. You’ll find 7 Counterintuitive Rules for Growing Your Business Super-Fast here and 9 Counter Intuitive Rules of Blitzscaling on this article on Linked In. Embrace Chaos - Blitzscaling, as defined, chooses efficiency over speed. A focus on order and regularity is replaced by accepting anarchy and disorder. Tolerate “Bad” Management – Management in Blitzscaling companies challenge the norms. Speed trumps having an organized and “well-run” business. Read Disruptive Innovation:The Exponential Organization - Las Vegas Growth Summit for examples. Launch a Product That Embarrasses You - This isn’t suggesting you make bad products or services. It’s the idea of failing forward, or faster. Once again speed is of the essence in Blitzscaling. Let Fires Burn – Since speed is critical, you have lots of fires burning. It’s important to focus on the one’s which could cripple the business. Do Things That Don’t Scale – In Blitzscaling, inefficiency is the rule, not the exception. In 7 Counterintuitive Rules for Growing Your Business Super-Fast they share how Airbnb’s co-founders decided to become the photographers to solve the poor-quality photo’s on their site. In addition Co-founder Nathan Blecharczyk had to stay in his apartment that doubled as their office to prevent their site from crashing. That’s an example of doing things that don’t scale, at least for the moment. Evolve Your Culture – A great book to read on what this means is Creativity Inc. We share some of the principles of this evolving culture in Candor Versus Honesty – Braintrust at Creativity Inc. Steve Jobs design of the Pixar atrium ensured people would bump into each other, forcing interaction. Are any of these ideas relevant to your business? 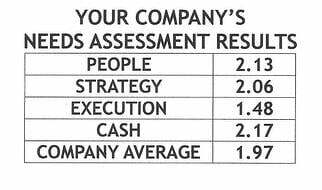 Review the Growth Factors for Blitzscaling. Chances are the mid-size business you created or work for, doesn’t require Blitzscaling to the degree it was required to grow, Google, Amazon, Facebook, Tesla or Airbnb. Yet the reality is speed and uncertainty are the new normal. Every business today is faced with Disruptive Innovation. 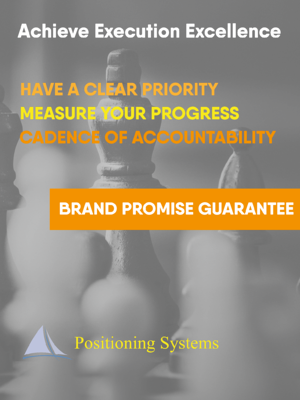 It’s important to recognize what this trend and to be prepared to throughout old practices that are productive in today’s dynamic environment. Speed and uncertainty Demand Strategic Discipline. The picture of Dandapani, our next presenter at the Denver Scale-Up Summit certainly rose eyebrows. 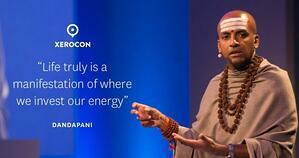 Yet this Hindu priest, self-development speaker, and entrepreneur shares insights on how to manifest your goals through investing in focused energy. We’ll share his insights next blog.